Solo travel is one of the most challenging forms of travel out there, but also the most rewarding. Last September I headed out on my very own solo adventure for 5 months and it changed my life. I can’t imagine ‘me’ without having done it. See my ‘Lessons I learnt and ways that solo travel changed me’ blog post here. Solo travel is a topic I get asked about a lot and quite understandably, there are a lot of fears associated with it. Now, i’m not here to tell you solo travel is a breeze. But then, in my opinion, no travel is a breeze. When you sign up to any kind of travel, you sign up for the good, the bad and the freaking life changing. Solo travel promises you all of the latter and is a leap of faith you will never regret taking. Solo travel shapes you and enhances your personal growth like no other. What am going to say though, is that solo travel requires a little extra preparation and a little more courage. Don’t you worry though, I am about to assist you in obtaining both. I’ve got you covered! 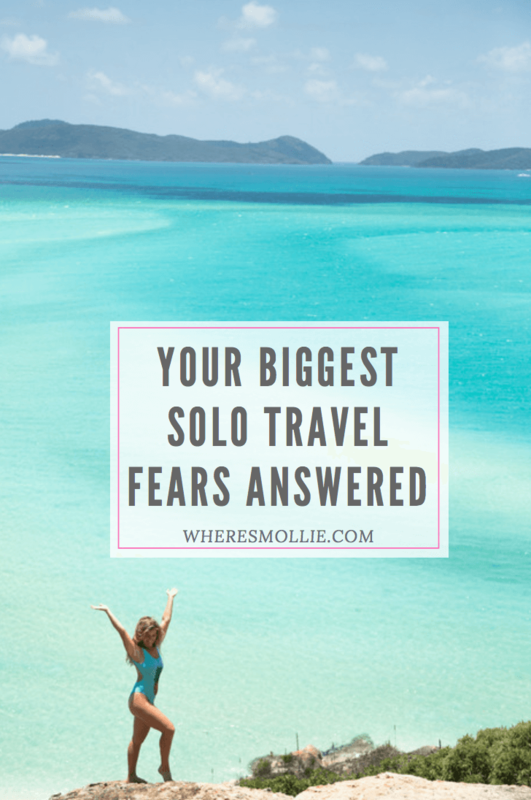 Recently I reached out to you all on social and asked you exactly what your biggest fears were about Solo travelling. I noted them down and I teamed up with my good friend Christianne (from Backpacking Bananas) to sit down and address each of them with our own personal experiences. It’s a 17 minute video, but if you’re going or considering solo travel – it’s a juicy chat and one that couldn’t possibly have been shortened without missing vital information.